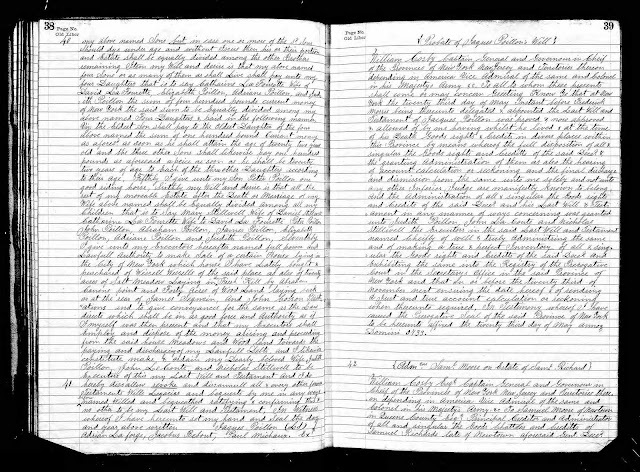 The subject today for Amanuensis Monday is the will and proving statement for the estate of James/Jacques Poillon (1681-1733) of Richmond County, New York, filed in New York County Surrogates Court files. Debts and funeral charges shall be paid and discharged. New York Surrogates Court, Probate files, "Wills Vol. 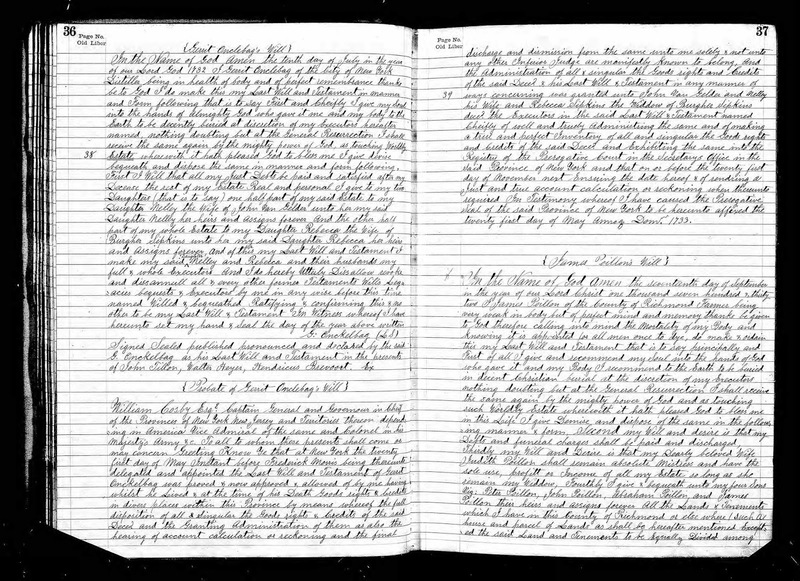 012, 1732-1736," pages 37-39 (images 53-54 of 305), James/Jacques Poillon will, 1733; "New York, Wills and Probates, 1659-1999," digital images, Ancestry.com (http://www.ancestry.com: accessed 10 September 2015). Note that James and Jacques is used interchangeably in these record. I believe that James was the English equivalent of Jacques. Jacques Poillon wrote his will on 17 September 1732, and it was proved on 23 May 1733. In the will, he named his wife, Judith, and nine children - sons Peter, John Abraham and Jacques, and five daughters, Mary Stillwell, Catherine LaTourette, Elizabeth, Adriane and Judith. Jacques Poillon married twice - first to Francoise Billiou (1685-1714), with whom he had daughters Mary and Catherine in 1710 and 1712, respectively. His second wife was Judith Bodine (1685-???? ), and they had eight children born between 1717 and 1732, but the first son Jacques died in 1730. It is quite likely that Jacques Poillon had given Mary (Poillon) Stillwell her portion before he died, and that was why she was not bequeathed 100 pounds like her sisters were. This record is a Derivative Source (because it is a Surrogates Court clerk transcription of the original will), contains Primary Information, and is Direct Evidence of Jacques death before the will was proved, and the names of his wife and children, including the married names of his two eldest daughters. Jacques Poillon and Francoise Billiou are my 8th great-grandparents. I am descended from the second daughter, Catherine (Poillon) LaTourette (1712-???? ), who married David LaTourette (1699-1764) in about 1730, and had four children, including my ancestor Marie LaTourette (1734-1786), who married Jonathan Lewis (1715-1785) before 1756.